Oops - we don't appear to have a video for the DR-4010C. We have been more than happy with the performance of the Canon DR-4010C scanner and with your support and follow up. We also find your sales team to be extremely informative and helpful when we are looking at scanning options and discussing our requirements. Please can you pass our thanks to the team. Rating of scanner thus far 5 out of 5. The scanner is in one of our branch offices and is used daily to scan into our document management system. It is easy to use and very reliable. The input tray does feel rather flimsy but has stood up to the jobs we have given it. We have had no jams or faults while using this scanner. The scanner has been working perfectly (touch wood). It is quick and very easy to use. It is also small and very compact which suits our small office down to the ground. The big plus for me is that it also uses up very little memory which I find is extremely useful when attaching pdf’s to emails. The DR-4010C is a next generation departmental scanner thats small in size but big on performance. Incorporating a host of new technology it delivers superb image quality and class-leading colour scanning speeds, and is ideal for individuals and departments that need dependable performance, and ease-of-use, in one compact package. A footprint measuring just 318mm x 278mm x 187mm ensures the DR-4010C is not only an incredibly compact departmental scanner  its one of the smallest in its class. 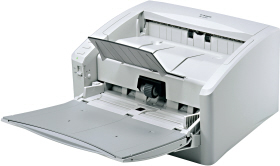 The DR-4010C handles all your scanning needs at identical high-speeds thanks to a 3-line CMOS sensor. Colour, black and white, and greyscale images are scanned at a swift 42 images per minute, and 84 images per minute using duplex mode. 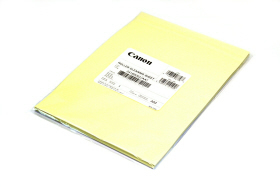 An auto colour detection function is incorporated, which detects which pages are in colour and which are in black-and-white and scans them accordingly. Documents with a combination of both therefore, can be instantly scanned in one complete batch  without needing to separate the pages first. The DR-4010C features a new shading mechanism, which ensures that - unlike some systems - paper dust cannot be accidentally adhered to the shading plate. So there are no unwelcome black lines on the images and no need for periodic cleaning of the shading plate to maintain quality. The 3-line CMOS sensor also ensures precise images with no colour staining. Two paper paths, either straight or U-turn, provide maximum scanning flexibility. Using the straight paper path and a secondary document eject tray means that media - such as plastic cards - up to an impressive 546g/m2 can be scanned. A number of easily-selectable modes allow you to enhance the scanned legibility of harder-to-read documents, using Canons advanced text enhancement capabilities. Documents with patterned backgrounds, light text on light backgrounds, and halftone backgrounds, can all be captured and improved. Similarly, on thin paper a function can be selected to prevent bleed through occurring on the scanned image. Canons CapturePerfect and Adobe Acrobat 7 Std are also included for added power.